These icicle strings of cool white crystal LED holiday lights from Green Watt have 100 lites and measure to be 18", 15", and 9" to create an icicle effect. It has male to female connections on a white wire. 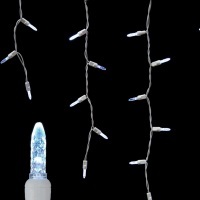 Using 9.5 watts of energy, this light string allows you to enjoy your holiday display without worrying about a significant increase in energy bills. In addition, take comfort in knowing unlike their incandescent counterparts, these LED bulbs remain cool to the touch.